On 24 March 2015, the UNU-IAS Operating Unit Ishikawa/Kanazawa (OUIK) held a public seminar on Satoumi in Noto Peninsula in Kanazawa City, Ishikawa prefecture. Attended by around 60 stakeholders from the fisheries industry, municipal government officials, local participants, and leading experts on socio-ecological production landscapes (satoyama) and socio-ecological production seascapes (satoumi), the seminar focused on the role and importance of Noto peninsula’s satoumi. To kick off the seminar, the Notojima Diving Resort made a video presentation showcasing Noto’s satoumi and how continual human interaction with coastal seas can maintain productive marine environments. Following the video, Mr. Tsunao Watanabe (Director of UNU-IAS OUIK) explained the history of the development of the “satoyama” and “satoumi” concepts in Japan. He noted that the Noto region was a befitting example of these landscapes and seascapes, as “Noto’s Satoyama and Satoumi” have been designated as one of Japan’s first Globally Important Agricultural Heritage Systems (GIAHS) by the United Nations Food and Agriculture Organization. The keynote speech was delivered by Prof. Tetsuo Yanagi (Professor Emeritus, Kyushu University), a pioneer in advocating the satoumi concept. According to Prof. Yanagi, there is still little research evidence that human activity can increase biodiversity in the marine environment, especially compared to the biodiversity benefits derived from satoyama landscapes. In order to increase interest in satoumi research and conservation, these studies must expand overseas, he said. In the following panel discussion, moderator Prof. Kazuhiko Takeuchi (Senior Vice-Rector of UNU) described how the socio-ecological production landscapes and seascapes (SEPLS) concept spearheaded by UNU had developed. He pointed out that satoyama and satoumi should not be viewed as separate ideas, and stressed the importance of understanding the ecological and socio-economical linkages that both concepts share. Panelists drew on local examples, providing fishers’ and divers’ perspectives. Mr. Yasuaki Iwamoto (Section Chief, Ishikawa Prefecture Fisheries Section) gave an overview on the state of satoumi in Ishikawa prefecture, highlighting Noto, where traditional fishing techniques are still practiced today. “Energetic young people will attract more young people,” commented Mr. Nobuhiro Kido (President, Ishikawa Association of Fisherman’s Leader), emphasizing the importance of appealing to younger generations whom he said should be given opportunities to take the lead in fisheries. Mr. Isao Kimura, owner of the local Kimura Isao Store, said he owed his success as an oyster farmer to the clean and nourishing river water that flows into the bays, illustrating the need for mutual understanding between upstream and downstream communities. 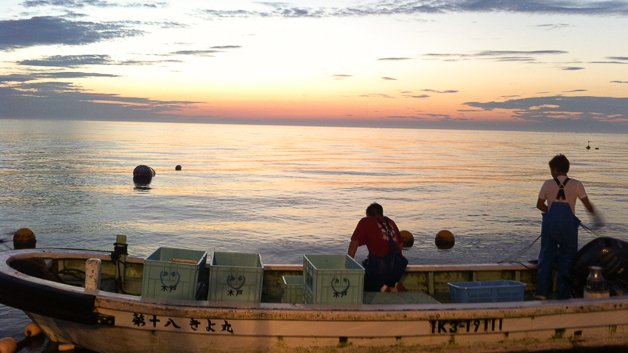 Ms. Mizuki Suhara, member of the Satoumi Nanao-Bay Committee and representative of Notojima Diving Resort, added that divers support local fishers, conserve satoumi and cooperate with researchers by checking seabed conditions, taking water samples and conducting underwater surveys. Closing the session, Ms. Evonne Yiu (UNU-IAS OUIK) reflected on the community’s efforts in conserving and maintaining Noto’s satoumi, which are apparent in the pristine water and litter-free seabeds. To promote further research and conservation activities related to Noto’s socio-ecological production seascapes, Ms. Yiu announced that UNU-IAS OUIK will launch the “Noto Satoumi Movement” in April 2015.